You Can't Spot Reduce: Learn Why! You can't spot reduce! The amount of misinformation on the market has spiraled out of control. There are now machines and gadgets that target the inner thigh, the outer thigh, the lower abs, the upper abs, etc. Learn why you can't spot reduce. In an effort to sound like they know what they&apos;re talking about, gym rats across the country mutter this phrase under their breath like it&apos;s their mantra. They will follow it up with a 30-minute lecture on the importance of diet to lose fat. "You can&apos;t spot reduce, dieting is the only way to lose body fat", they&apos;ll say, as the peons of the gym look to them in awe. And what do the mighty gym rats proceed to do after the small-armed people are done worshipping? They do 200 crunches, 100 leg lifts, and just for fun, follow it up with some plie squats for those hard-to-target inner thigh areas. Are you getting the sarcasm in my words? You can&apos;t spot reduce! The amount of misinformation on the market has spiraled out of control over the past few years. There are now machines and gadgets that target the inner thigh, the outer thigh, the lower abs, the upper abs, and I could go on and on. As personal trainers, you need to be on top of your anatomy and physiology and be able to easily discern fact from I-must-sell-something fiction. There are no upper and lower abs! There aren&apos;t! I promise! The trunk section is composed of the Rectus Abdominus, which is responsible for flexion of the trunk (crunches); the Internal and External Obliques, which assist in lateral flexion (side bends); the Transverse Abdominus, which compresses the abdomen; and the erector Spinae which extend the trunk. 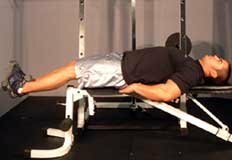 Notice that none of the abdominal exercises work to lift the legs. The myth that leg lifts of any sort work the so-called lower abdominal are completely false. What you are actually working are the 3 psoas muscles, which act to flex the hip. When doing leg lifts or raises, your abdominal muscles may come into play as a stabilizer muscle but unless you are flexing your trunk as the last motion of the movement, you abs are not being used. Keep in mind that your psoas are directly under the lower portion of your abdomen, which may make you "feel it" in your lower abs, but it is actually your hip flexors. Flat Bench Lying Leg Raise. It is also not necessary to work your abs everyday. Quantity will not lead to a trimmer waistline. In fact, overworking your abs may lead to accumulative microtrauma. If the conditions are right, fiber fusion will take place and your abdominal muscles may actually hypertrophy. 500 crunches a day will certainly not lead a trimmer waistline, only decreasing overall bodyfat will do that. The definition of a tone is actually referring to a state of contraction of the muscle. The whole myth of more reps will tone your muscles and less reps will grow more muscle is a little off. First of all, you can gain muscle mass, you can lose muscle mass, you can gain fat, you can lose fat, but you cannot tone a muscle to make it look pretty. If you perform a high rep exercise, you are simply training in an anaerobic strength endurance state. The tone that people are referring to is not going to come unless you lose body fat. The largest purveyor of this myth by far are the fashion industry magazines. First of all, why are you taking fitness advice from Vogue? Contortionist exercises such as Plie squats should be avoided at all costs. They are damaging to the knee, ankle, and hip joints. Furthermore, muscles such as your abductor and adductors will get a workout from safer movements such as side lunges and squats. Certainly, they are legitimate muscles that should be worked, especially if you are training an athlete that does a lot of jumping and side-to-side moving. But developing a workout that will hit these muscles 3-4 times a week will only lead to overtraining. [ Click here to learn more. ] Stop Overtraining Now! Adding variety to an exercise program can improve adherence and can also help you stay physically challenged and mentally stimulated. Also keep in mind that overworking your hip flexors, abductors, and adductors can lead to over-development of these muscles. In the case of your hip flexors, you can actually cause lower back strain because the overdeveloped hip flexors will put strain on the hip joint and pull it out of alignment. The fact remains that the only way to achieve any of these myths is to lose body fat and gain muscle mass. You should follow these basic guidelines with all major muscles groups when designing a program. Progressive overload - You will increase in strength and muscle size if you progressively increase the intensity of your workouts. Decrease body fat - Through dietary manipulation and exercise, you can decrease your body fat and increase your lean muscle mass, which will lead to that "toned" look everybody wants. Periodization - All muscle groups should be periodized. No muscle groups should be trained everyday or even every other day. 2-3 times per week, for advanced bodybuilders, is enough. I realize I only touched upon a few basic ideals in this article. In upcoming issues I will further discuss regional hypertrophy (the idea that certain angles of exercise target certain parts of an individual muscle) and how fat is actually metabolized. This will give you a better idea of why these myths are just myths and not fact. Please email me with ideas on future articles and what topics you would like to learn more about. Disa Hatfield B.S. My email is smallsquat@issaonline.com.